Adhesive cement, we recommend Sika or Weber. A shovel and a trowel to spread and apply the cement, respectively. Do not use other types of adhesives such as: high-strength and fast-drying because they do not allow the thermal expansion of the elements and create tension that can crack or even break the barbecue. All parts of the barbecue must be attached with adhesive cement and be levelled for each row. 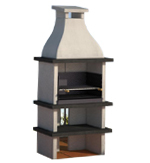 The assembly of the barbecue may look like a puzzle but it is actually very easy and intuitive. Artificial stone is a very hard and resistant product it must be handled carefully due to its weight; a damaged or broken part may harm resistance to fire and temperature changes. 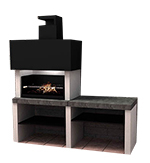 The area selected for assembling the barbecue must be flat and resistant and it may be built at ground level or placed on a pedestal. In addition, always respect the barbecue’s measurements and the size of the grill so that when you attach the side sections they fit perfectly. Two people will be required to assemble the barbecue; remember that the area where you assemble the barbecue must be sturdy and elevated. Use adhesive cement to attach the different parts together. Firstly, attach the barbecue’s feet to the floor, leaving enough space between them to attach the trays (if the barbecue has them). If your barbecue has one or two side trays, bear in mind that two of the feet have to hold two trays. Once the feet are attached, place the first tray on top of them and check that it is completely level, place the other feet on top of this tray. On top of these feet, place the tray which will be used for the fire areas and the walls thereof. Remember to place the box and the iron grill within the fire area, without attaching them and leaving a small air chamber between the box and the walls. 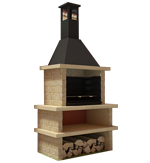 On top of the walls, we place the tray which includes the vent for the smoke to escape and the chimney on top of this. 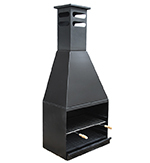 If your chimney is uncoated, attach it using adhesive cement and if it is made of iron use heating silicone. Finally, grout the parts so that everything is sealed and attractive, be careful not to soil the barbecue. 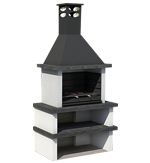 After assembly, wait 24 hours before using the barbecue. 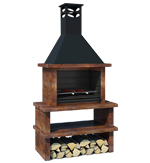 The fuel used must be firewood or coal and it must always be used in moderation so the flames aren’t too big and to avoid expanding the chimney. The first time that you use the barbecue, only use coal for one or two hours to eliminate any moisture resulting from the assembly. You will not see big flames to begin with as the materials need to adapt to the fire. Do not use water to put out the fire; to avoid cracks due to the drastic change in temperature, allow the fire to go out gradually. To create a fire, do not use any type of liquid, alcohol or gasoline as this will alter the taste of your food and may cause poisoning.